This series of posts will mostly show photos of Keila from 21.04.2013, but in addition there are few others too (too little for their own post). This was my first photo from Keila and this put me into waiting mode for this town which eventually realised 7 years later. These were probably taken from a bus window. 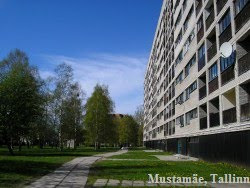 Many years later I discovered that there are almost identical but red-brick houses in Hiiu/Pääsküla in Tallinn. Typical halo. This is more common than rainbow but people just don't look into sky. This one looks quite interesting. If it had only two floors, it would be much more common as such. Yes, this was a rare moment when there was halo and a random huge change of brightness in clouds. Here is also very typical sundog at the right edge, although it has a form of the cloud which helped to form it (instead of a round- or stripe-like spot). As usual, the whole halo thing changes as quickly as clouds change. I can't remember such a stark contrast in any other halo photos that I have taken. I am absolutely sure that that water is actually a typical spring inundation of lawns near rivers. This house has very interesting colours! Wow, this is just wow! A soviet time paradise. Reminds me Maardu actually but Maardu had 9-floorers.